Showcase your love of hummingbirds throughout your landscaping with these Ancient Graffiti Flamed Copper Colored Staked Hummingbird Garden Ornaments. This set of 4, striking metal adornments brings wonderful avian style to your garden with ease. 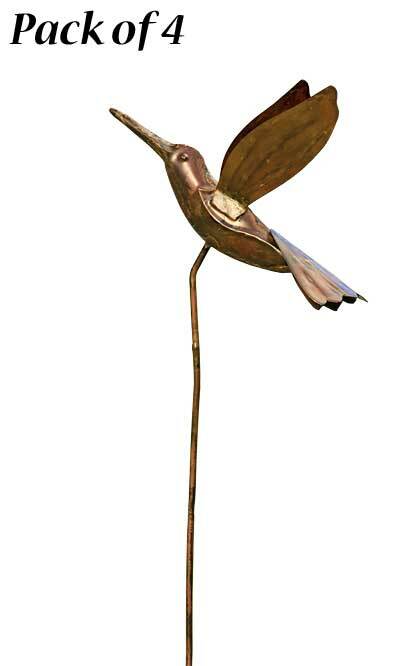 Two lifted wings, a raised head, and a downward sloping tail on each figure form classic, hummingbird silhouettes, while a flamed copper colored finish on each adds dimension. The 23" long, metal shafts lend fantastic height to the pieces, and their 3.25" long, step-in bases make installation simple. Impressed lines on the wings, flared tail, and bird�s body provide remarkable detail to each piece, and the brown hues celebrate the natural world. Place four beautiful "flying jewels" throughout your garden with these Flamed Copper Colored Staked Hummingbird Garden Ornaments. Note: This case pack contains 4 of the Ancient Graffiti Staked Hummingbird Garden Ornaments, Flamed Copper Colored.